After a trying year that has tested Japan with severe floods, record-setting heat, and fierce typhoons, the country was yet again challenged in September when a magnitude 7 earthquake jolted the northern island of Hokkaido, causing dozens of deaths and leaving millions without electricity. But it’s in the midst of such tragedy when the best of humanity can be seen, and that was once again true throughout Japan’s soccer community as fans, players, and clubs leapt into action to raise funds toward revival efforts. Such displays of support are emblematic of the J. League’s growth over the last 25 years, which have seen it expand from 10 clubs to 54 across three divisions. As clubs have fostered close ties with their local communities, they have become symbols of the cities and regions they represent. When disaster strikes, J. League clubs based in the affected area are often amongst the first non-governmental organizations to take an active role in relief efforts. Following the March 11, 2011, earthquake and tsunami in eastern Japan, the league mobilized clubs under the “TEAM AS ONE” banner, beginning with a charity match in Osaka between an All-Star selection and the Japan men’s national team. Players are often seen at stadiums and train stations holding donation boxes, drawing hundreds of fans eager to contribute and exchange a few words with their favorite stars. 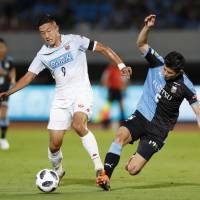 “Pro soccer players have a lot of influence and it’s great that we can go out there and solicit donations and help people in the affected areas,” Frontale striker Yu Kobayashi said. On Friday, second division side Roasso Kumamoto’s squad announced a charity auction of signed equipment in support of Hokkaido. 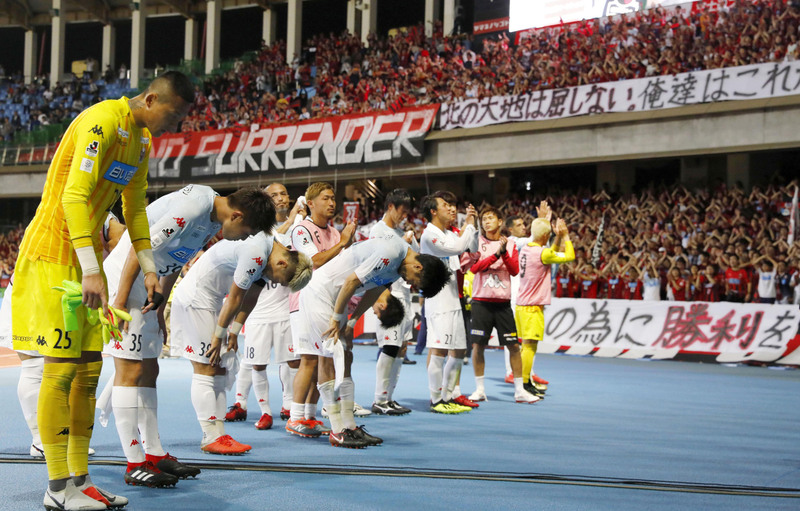 The poignant gesture took place nearly two and a half years after several strong earthquakes rocked Kumamoto Prefecture, forcing Roasso to postpone several matches as clubs across the league rallied in support of the Kyushu region. “Whenever something happens in Japan, it doesn’t matter what region it is: we all have to do our part,” Nakamura added. “And one thing we can do as players is go out there and play and inspire people and give them something to cheer about. His sentiments were reflected by teammate Kobayashi, who was with the Samurai Blue in Sapporo when the earthquake struck, eventually forcing the cancellation of the team’s scheduled friendly against Chile at Sapporo Dome. Japanese stadiums are often used not only as distribution points for supplies, but also as evacuation shelters. Yet even as these efforts are in progress, there are still games to be played. The ensuing 7-0 Frontale victory was far from the uplifting result one might have hoped Sapporo would achieve. While the J. League sometimes rearranges schedules in deference to safety concerns, players often have little choice but to play on in less than ideal circumstances. “We didn’t train for six days. We couldn’t eat properly because the food was gone at the supermarket,” Sapporo striker Jay Bothroyd said. “You’ve still got to come here and be professional. When you play (as we did tonight), I have tears in my eyes. Bothroyd’s teammate Chanathip Songkrasin, who has become the league’s most successful Thai player since joining from Muangthong United last summer, urged foreign tourists not to shy away from the region. “There were a lot of power outages, but Sapporo is returning to normal and people (from overseas) shouldn’t hesitate to visit and enjoy themselves,” he said. Like Vissel Kobe in 1995, Albirex Niigata in 2004, and Vegalta Sendai in 2011, Consadole will aim to rally local residents when they host Kashima Antlers on Sept. 23. 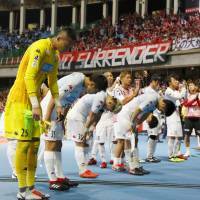 After Saturday’s resounding defeat, players know a result at Sapporo Dome will mean even more to the team’s faithful supporters. “We represent Hokkaido, we represent Sapporo,” Bothroyd said.